The IK2 intermediate prover is intended for high output of up to 3000 pc/h, where pieces of dough weighing up to 1200 g have been previously rounded and are ready to rest. It is charged via two entry transporters, which means a better yield and less stress on the dough. Feeding is controlled by photocells and a pneumatic hatch which prevent two dosages being fed into one basket. The operation can be continuous or step by step, depending on the size of the prover. 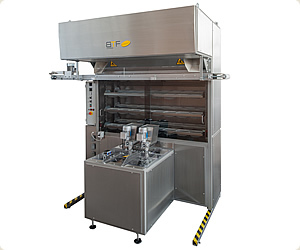 The exit transporter has photocells to prevent two pieces of dough from falling into the moulding machine. Baskets are made of special plastic which does not absorb moisture and prevents the dough from sticking. An ultraviolet lamp prevents the growth of bacteria and mould. A fan is used to remove excess humidity. The construction enables easy supervision of the resting of the dough. Entry can be from the front or the back. Several variants are available. Provers are custom-made, depending on the resting time and production speed required.